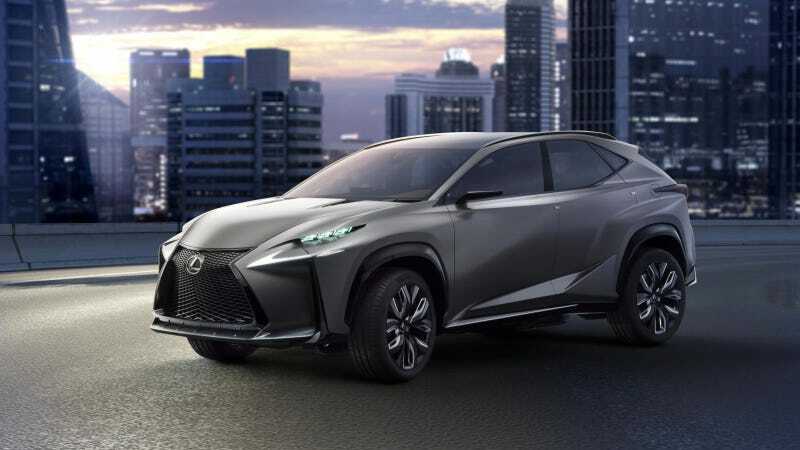 Lexus showed off a few more photos of their LF-NX Concept compact luxury crossover this morning, ahead of the Tokyo Motor Show later this month. Besides releasing a few more photos of the Transformer-looking shopping hauler, Lexus confirmed the concept would get a 2.0-liter turbocharged four-cylinder engine, instead of the hybrid version shown in September at Frankfurt. Why's that a big deal? The 2.0T is likely going to be an engine in the production version of this car, as well as the replacement for the tired old 2.5-liter V6 that still powers the volume IS250 – the one that just got panned by Consumer Reports. With just 205 horsepower, it makes less power than competing boosted fours from Audi, BMW and Cadillac. And it's less fuel efficient. So with the NX that's due next year, Lexus will finally catch up to luxury rivals by adding both a compact luxury crossover to their lineup, as well as a turbo four to its compact sedan. Expect to see them everywhere soon.